Z270 Motherboard (ATX) with Carbon Look, with 3× PCIe 3.0 x16 (x16/x8/x4), 2× USB 3.1 (1x Type A & 1x Type C), 2× M.2 (PCIe 3.0 x4) & 6x SATA 6G, 8× USB 3.0 & 6× USB 2.0, MSI Mystic Light LED Control The MSI Z270 Gaming Pro Carbon is an ATX motherboard utilising Intel's Z270 chipset for Intel processors from the 6th ("Skylake") and 7th (“Kaby Lake”) generations on socket LGA 1151. The chipsets from the 200 series, known as "Union Point", come with up to 24 PCIe Express 3.0 lanes and bring more overall HSIO lanes (High Speed I/O) as well, thereby enabling more internal connections (such as SATA or PCIe slots) to be used simultaneously. As a Z270 motherboard, the MSI Z270 Gaming Pro Carbon enables overclocking of K-series CPUs, which offer completely unlocked multipliers. The MSI Z270 Gaming Pro Carbon is a very well-equipped ATX motherboard with Intel’s Z270 chipset for Intel's processors of the 6000- and 7000 series. This black-themed board comes with three PCIe x16 slots, of which one comes connected via 16 full lanes to the chipset, while the other PCIe x16 slots are connected electrically via four i.e eight data links. For I/O and expansion cards the board provides three further PCIe x1 slots and supports NVIDIA's SLI as well as AMD's CrossFireX technology. In order to connect the very fastest data storage devices, the board comes with two M.2 slots for extreme NVMe M.2 SSDs, as well as six SATA 6G ports for 3,5" or 2,5" hard drives and SSDs (including RAID support). The M.2 ports are connected via four PCIe lanes on the 3.0 standard to the chipset and, in combination with the NVMe protocol, enable a data transfer rate of almost 4 GB/s. This allows M.2 PCIe SSDs to function up to eight times faster than SATA 6G SSDs! One of the particularly unique features of the MSI Z270 Gaming Pro Carbon is the MSI Mystic Light controller with RGB-LED header and the carbon-look of the motherboard. The I/O panel of this motherboard offers connectivity to the new USB specification, USB Type C, a port with a new slim profile and the ability to be plugged in either way. Apart from the Type C port the motherboard also offers backwards compatibility with USB 3.1 Type A. USB 3.1 ports are rated for a maximum achievable throughput of 10 Gbit/s, twice as fast as traditional USB 3.0 ports! As far as input devices and other gaming peripherals are concerned, the I/O panel also offers 4 USB 3.0 and two USB 2.0 ports respectively. If no graphics card is available, the integrated GPU on the Skylake or Kaby Lake CPU allows for monitors to be connected directly to the rear of the motherboard - and both HDMI and DVI-D are provided for this purpose. Internally the motherboard offers - among other functions - five 4-pin headers for PWN fans as well as XMP support and an array of overclocking features. 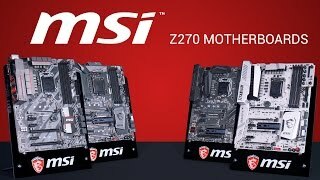 More links for "Z270 Gaming Pro Carbon Intel Z270 (Socket 1151) DDR4 ATX Motherboard"
I bought this for my son's PC build, and I love everything about it! Great design, led accents in all the right places. Plenty of capability and reliability, which is to be expected of an MSI product. 3x m.2 slots which is nice, one of them being covered with a heat plate and a thermal pad is awesome. it's nice to have a choice in LED colours, even if it isn't a massive RGB range, as not everyone is going with a black and red theme. Overall I love this board and highly recommend it! A Great Z270 Motherboard for the Price! First off, this thing is really good looking. If you're buying this, I'm sure some of it has something to do with looks. Love the rgb, subtle enough that it's not distracting but still nice to look at. I think this is an amazing motherboard to get if you want a quality product and a good brand behind it. I have had no issues whatsoever, and it's been very stable for me. I definitely recommend this board for folks interested in building a new system that came from 2 or more generations ago. People who already have invested in Z170 boards should stick with their current mobo and just do the BIOS update if they wish to install Kaby Lake. I can tell a very slight increase in speed from Skylake. Not enough to warrant an upgrade but definitely worth it if upgrading from 2 or more prior generations. Fantastic motherboard, easy bios and love the RGB lighting. Not had it too long but it does what it's supposed to! It looks fantastic sat behind any Windowed case, especially with the RGB LEDs allowing you match your systems' theme'. Though not directly an issue of the board itself, The MSI Gaming App is next to useless when trying to get the colour you want. It needs type-able numbers instead of a dial..
Oh... Again this could just be me, but It doesn't seem to have any Powered USB slots when shut down, even when the settings are changed in W10. :/ but I could have missed something.. Overall very happy with how it's performing, no issues setting everything up and looking forward to using the M.2 slots! Managed to slap my 7700k straight up to 4.9 Just with 'Gameboost' at sits stable at 5Ghz. Hurrah! I love the RGB lighting, BIOS is one of the easiest I've used. I got this motherboard with the new i7 7700k, and I have to say. It's BIOS has to be one of the easiest I've used. The RGB lighting is beautiful, but if you aren't a fan of that you can easily turn them off. "The MSI Z270 Gaming Pro Carbon is a great buy if you're looking to get onto the Kaby Lake train for a modest investment, having all the key Z270 features backed up by some pretty good on-board lighting."